Lewis Hamilton’s first Grand Prix wins make world-wide sporting news. Adulation reigns. In England, Hamilton’s triumphs have taken the publicity spotlight off injured Tennis star Andy Murray. Even David Beckham has been pushed into second place. But Wimbledon looms. If Murray wins, can the Great British public find the emotional wellsprings to embrace more than one super-hero at the same time? England has another sporting idol. Front and back pages of the papers had been widely covered by the story of Lewis Hamilton and his astonishing first months as a Formula one driver. His Grand Prix wins at Montreal and Indianapolis means that all bets are off for that indicator of popular sporting affectio , Sporting Personality of the Year. In December, Lewis will be up on yet another podium. Then he will in all probability be flanked by two other favorites for what used to be called the housewives’ votes. In years of limited sporting triumphs on the international stage, voting tends to be a reflection of national affection. But gallant national near-misses will from time to time be thwarted by an international success. So, this year Lewis Hamilton will collect another first place. Frankie Dettori may not end the season as champion jockey, but memories of a great series of classic wins this summer may be enough to get him to second place. There’s still time for a British golfer to beat Frankie into third place, but this will take a win in a major, maybe at Oakmont, starting this week (I’m hoping, but not betting on that one). Or maybe Andy Murray will somehow sneak in ahead of Roger F. and Rafael N. at The American Open later this year. Injured at present, he promises a last-minute decision on playing the big one, Wimbledon, in a few weeks time. In years without significant international success, the continued progress of cricketer Monty Panasar, who is consolidating himself in the public’s affections, would have been enough. But not this year. Anyway, his iconic status may also just have wobbled a bit. That engaging enthusiasm may have been seen as bordering on the unsporting through excessive appeals to the Umpires, in this week’s the victory over the West Indies at Old Trafford, Manchester. Yes, Monty, Great British sporting idols have to be like Caesar’s wife in that one respect. You have to be above suspicion of taint or of falling short of the highest standards of sportsmanship. Which is why Lewis Hamilton will be under the most intense scrutiny for several glittering years. The image of perfection will be tested unto destruction. And do you know what? A young man for whom fame and fortune is guaranteed, will one day show he is human. He will drift a few inches too far and too fast, maybe on the race track. Maybe in a dark place suddenly illuminated by the flash of light from a Paparazzi’s camera. The former will be more physically dangerous. The latter is likely to be temporary. Then the public will be on the emotional roller-coaster ride manufactured for us by those who help create the stories of our sporting heroes. 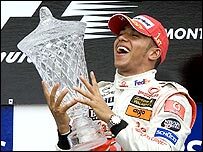 Lewis Hamilton wins a second Grand Prix. Local acclaim becomes even higher. Memories of Frankie’s triumphs decline. Monty is not so much of a hero in the final Cricket test against The West Indies. David Beckham manages the threat to his pole position in sporting celebrity as courageously as you would expect. He is helped by a football result. In an emotional night, playing in his last game for Real Midrid, Read win a thrilling game to grab their thirtieth Liga title, and twart rivals Barcelona. But even Beckham’s publicity machine can’t match Lewis in his flying machine. Would Andy, even with a dramatic final win over Reger Federer in a Winbledon final, be enough to surge to a top podium position? You are currently browsing the archives for the Lewis Hamilton category.